If you want an upgrade from motherboard audio with better sound quality and more features then the great value for money Xonar DGX 5.1 is ideal. 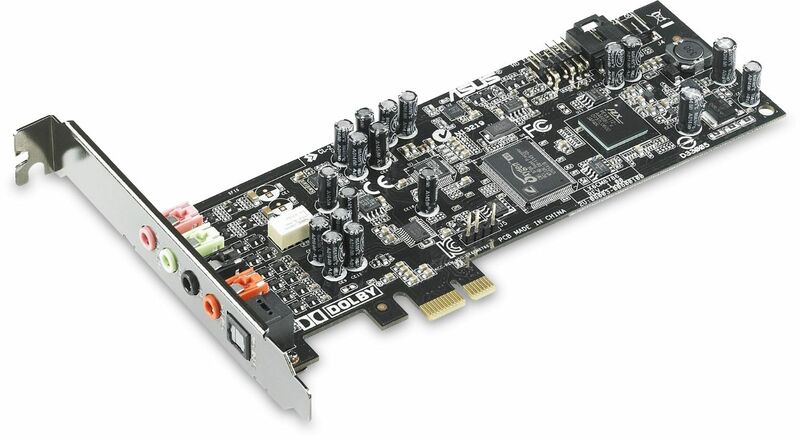 The Xonar DGX audio card combines Dolby Headphone 5.1 high definition surround with the ASUS-exclusive GX 2.5 gaming audio engine and an on-board headphone amplifier. These result in accurate and deep audio that brings every nuance and sound across fully, making the Xonar DGX 5.1 an ideal audio card for gamers who want to remain totally aware of their play environments. The Xonar DGX uses three modes to cater to different usage scenarios: voice, pro-gaming, and exciter modes. Sound positioning helps gamers become better informed of environments and thus more competitive, especially in multiplayer first person shooters. The Xonar DGX 5.1 uses Dolby Headphone technology to level up your stereo headphones to surround sound brilliance. The exclusive ASUS GX 2.5 gaming audio engine on the Xonar DGX 5.1 allows up to 128 different sound effects simultaneously for a realistic 3D audio environment. It also offers full compatibility with the latest version of EAX®. The Intel HDA-compatible front-panel header automatically switches output between the back and the front of the case once speakers/headphones are plugged in. Never again will you be bothered by the need to change connection settings manually!